An excellent vegetarian main, or side salad. Very easy to prepare and full of fantastic flavours. The tomatoes add moisture and the tangy dressing balances the spicy flavor from the chilli. The black mustard seeds are necessary as they add most of the fragrance and make the dish. Soak the quinoa in cold water for 15 minutes. Drain and put in a saucepan with 600ml water. 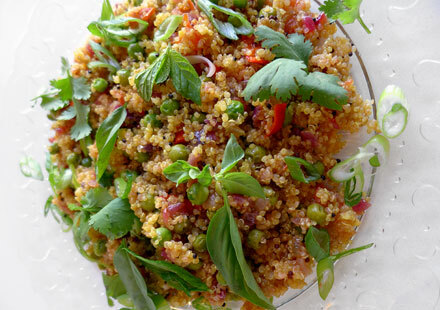 Bring to boil, reduce heat and simmer until quinoa is crisp tender, about 15 mins. Drain and set aside. Heat the olive oil (medium heat) in a large pan. Add the mustard seeds and sautee for a while until they are fragrant and begin to pop. Add the onion and then the ginger. Sautee until they are soft. Add the chilli and stir for another minute or so. Add the tomato and sautee until most of the water has evaporated. Add the peas for a minute and then the cooked quinoa. Add salt and pepper to taste. Mix the lemon and sugar and pour over the quinoa. Add the basil, coriander and spring onions, mix well and serve.